Happy 20th Anniversary to “Colonel Homer”! Original airdate 26 March 1992. Thanks to its relentless insistence on being both bland and repetitive, Zombie Simpsons manages to be incredibly forgettable despite its long run on television. Earlier in the week, I joked about “Them, Robot” swarming with magic robots, but I’d completely forgotten that they already did an episode swarming magic robots this season, “Replaceable You”. 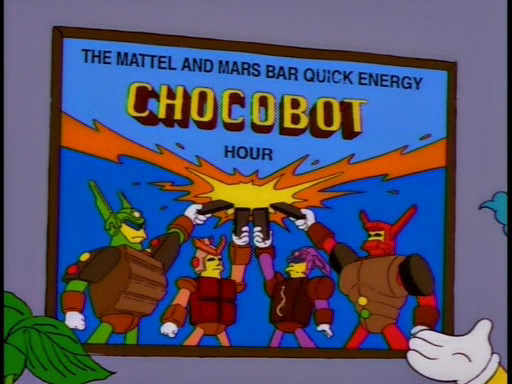 In case you also forgot (though not everyone did), that was the one where Bart and Martin build an army of robot seals who turn evil and then good again. 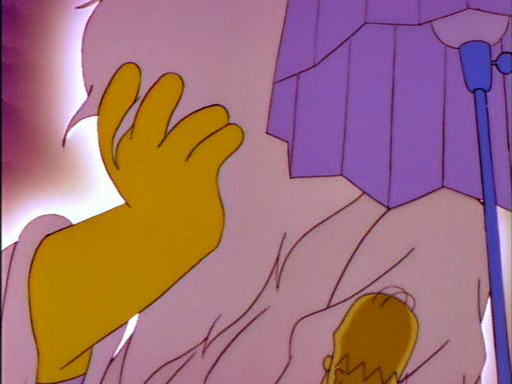 If Zombie Simpsons has a virtue, it is that it is easy to forget most of it, and this week we’ve got two links about exactly that, one with great imagery. In addition to that, we’ve got an excellent variety of fan made stuff in mediums as diverse as sand and yarn, an interview with Alf Clausen, some Lego ads, a YouTube video that makes me want to sit down, and several people who agree with us. South Park has benefitted tremendously from its ability to shift its format and focus between different characters. Sometimes it works and sometimes it doesn’t, but they aren’t stuck repeating things because they’re wedded to a specific template. The only thing I’d add is that they can do that because Parker and Stone have all the leverage vis-a-vis them and Comedy Central. That show is the two of them, including the bulk of the voices. On Zombie Simpsons, no one person has the ability to say “That sucked, we’ve got to try something new”. 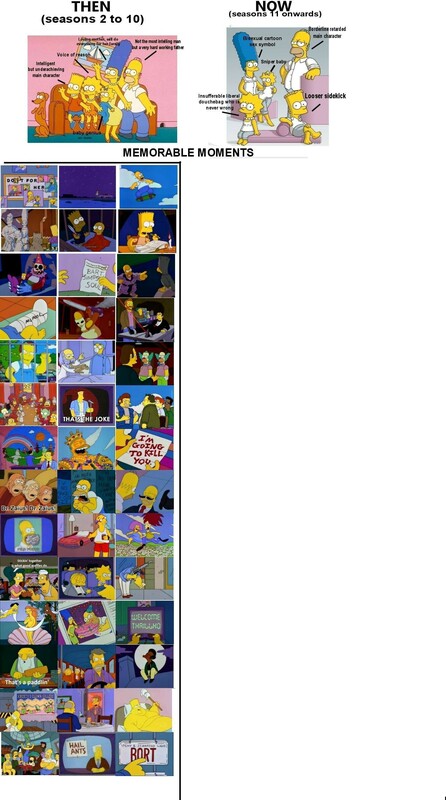 Even if Brooks, Jean and Groening all walked off the show, you know what would happen? FOX would keep making episodes with whoever stayed. On South Park, Parker and Stone have the kill switch; on Zombie Simpsons, FOX has it. Drinks’ On Simpsons – A nicely photo-documented project to create customized, homemade Simpsons coasters. If I had any furniture that needed coasters used, I would want those. They’re fantastic. Homer Simpson Crochet Toy – Check out this amazing foot tall, fan made Homer doll. All the details are there, right down to the eyelids. That’s fun and all, and bonus points for no Zombie Simpsons, but I kind of feel like Chief Wiggum watching the monorail race around the city. 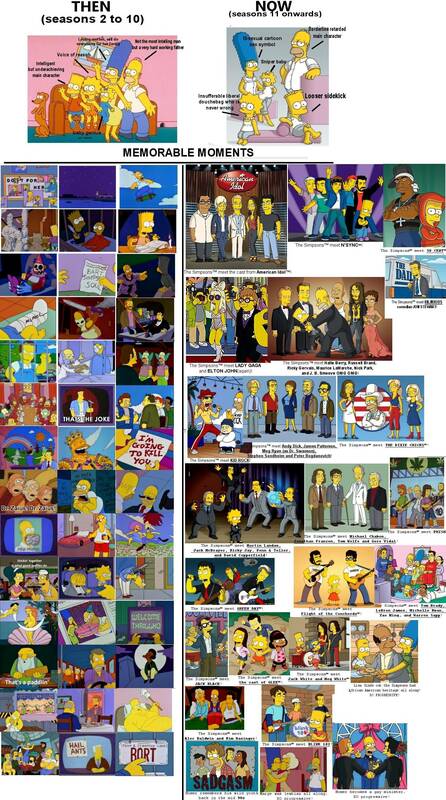 The Simpsons is a classic cartoon, and it is extremely unlikely that anyone hasn’t heard of it. It has severely declined in quality since the first few seasons, and the jokes most people remember as hilarious are actually from the first few seasons. 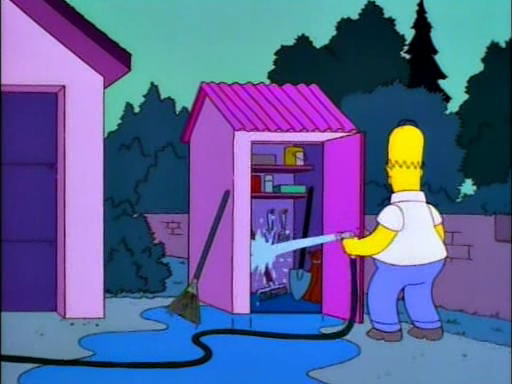 In all the times I come across poor, moderate and excellent usage (not all of which I post about), it is amazing how infrequently people mention anything from Zombie Simpsons. Whether it’s someone writing a blog post about being pregnant or going on vacation, a reporter opening a story, or anything else, it feels like I see a hundred or more references to The Simpsons for every one I see for Zombie Simpsons. I don’t keep count or anything, but it’s overwhelming. Speaking of remembering jokes . . . They called this one “Fixed”, and I agree. Unless you’re a particular fan of this or that celebrity or band, they’ve had so many people on as themselves now that they all just fade into one incoherent fog. I’m not sure who created the first one or fixed the second one, but if you want credit just let me know. Kudos to both. National Treasure Director Jon Turteltaub, The Simpsons former Producer Jay Kogen, and New York Times Bestselling Author of Midwives Chris Bohjalian, and Pulitzer Prize winning author James B. Stewart are among the headliners for the SCCE’s 11th Annual Co – As you can tell from this monstrous (yet cutoff) headline, Jay Kogen will be speaking to a group called SCCE, which stands for the Society of Corporate Compliance and Ethics. The conference isn’t until October, and there’s no real news here, I just thought it was amusing that they put “Compliance” ahead of “Ethics”. Santa Cruz X The Simpsons 500th Episode Slasher Deck – An eyes-out, wheels-off Bart skateboard design. At the 500th session, you took time to make special mention of some musicians with whom you’ve worked for decades. In what other capacities have you worked together? 250. Lego Imagination – Much was made this week about these new Lego ads that are minimalist renditions of famous cartoon characters. Here they are all scrunched together. ‘Hunger Games’ Characters as ‘Simpsons’ Stars – Speaking of things that were linked all over the place this week, these Hunger Games characters done in yellow with no chins (via). Writers for "The Simpsons," "M*A*S*H" among panelists for Aspen Shortsfest – Mike Reiss will be judging a short film festival that runs April 10th-15th in Colorado. One of my all-time favorite episodes of "The Simpsons" was aired way back in 1992. 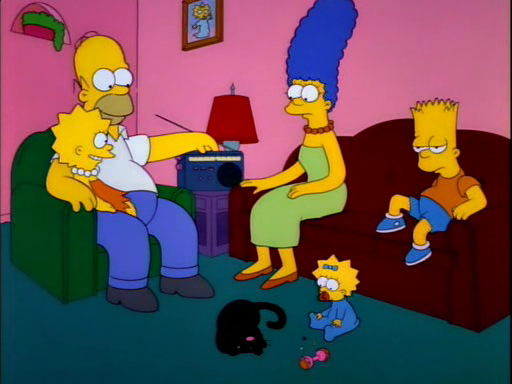 It was called "Homer the Heretic," and towards the end of the episode, there’s a serious fire in the Simpsons’ home. After everyone is safe and the fire is put out, an insurance agent asks Homer, "Any valuables in the house?" He replied, "Well, the Picasso, my collection of classic cars…"
The agent replies, "Sorry, this policy only covers actual losses, not made-up stuff." 100 Best Comedy Characters Currently On Television (40-31) – Continuing the list from last week, here we have Flanders checking in at #40. I’m beginning to think Michael Bay is the greatest troll in the history of the internet (at least the pop culture part of it). There’s an alternate universe where he’s the assistant manager of a surf shop who spends most of his time posting inane comments on blogs and message boards. Marge and Maggie Simpson on Mothers Day 2012 – I’ve linked to this guy’s sand drawings before, and his Flickr page has plenty more. Cheers to Martin Artman. Luckily, three actors known for their diverse voices have signed on to ensure that worries about the size of the cast don’t drag any negative energy into this tournament. From the Jesus to pornographer Jackie Treehorn to the irate neighbor who “kills” the Dude’s car, most of the small-but-memorable roles will be handled by a versatile trio. Nick Kroll and Patton Oswalt, two veterans of the live-reads, will be joined by The Simpsons’ Hank Azaria to “cover the field” of different characters in The Big Lebowski, Reitman says. “There will be a moment when the three nihilist will be played by Patton, Nick, and Hank, and we’ll be getting each of their German accents,” he laughs. I mean, say what you want about the tenets of Zombie Simpsons, Dude, at least its an ethos. Homer and Marge Simpson Beer Bottle Cozies via Flickr – Nice. Custom of the Week: Ralph – Last week we had some ponies redone as the Simpsons clan. Here’s one of Ralph Wiggum. Cool Party Trick – Animated .gif of that Irish bartender from “Pygmoelian”. Scooby Doo Fan Art # 3 (Mash-Ups) – Drawings of the Scooby Doo gang in other franchises, including Simpsons. The Ghostbusters and Ghost World ones are particularly good. Handheld Classics: Bart Simpson’s Escape From Camp Deadly – A review of a Gameboy game I had completely forgotten about. Eat More Bikes: Post Apocalyptic Bart Simpson. – A four pane comic. I chuckled. The place of Ireland’s national day in popular culture was neatly summed up by that great sage Homer Simpson: "It’s been St Patrick’s Day for hours, and I’m not drunk yet." It’s actually “I’m still not drunk yet”, but that’s close enough for excellent usage. Canada News, Commentary, Analysis, Blogs – Excellent YouTube usage about the amount of food that gets thrown away every year. … He’s Real! – Herschel, pie is for noshing, not for throwing. 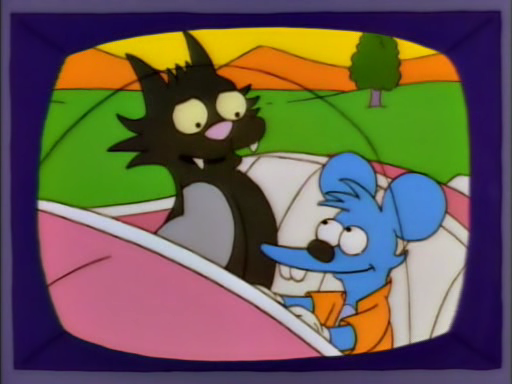 Inside The Simpsons’ "Life on the Fast Lane" – Splitsider apparently now has a regular feature where they watch old commentaries. Huh. P.S. 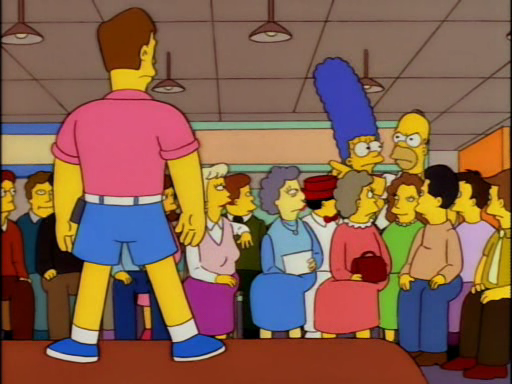 If you’re not a fan of The Simpsons in their halcyon salad days of consistent greatness, (roughly Seasons 1-10, before a team of writers who sound like snooty grad students fresh out of college started working for the show) then I’m not sure we can stay friends. At this point, I wonder if the current writers have seen the previous seasons of the show. Maybe it should be required viewing so that they can be reminded of how great things used to be and what our expectations are, instead of just trotting out the same ideas in lesser forms. But clearly that is expecting too much. These characters are happy to recycle the same actions again and again without question. Maybe utilizing these things for their money-producing powers is for the best. I have nine levels until I reach level twenty, and these pretend friends won’t impress themselves. 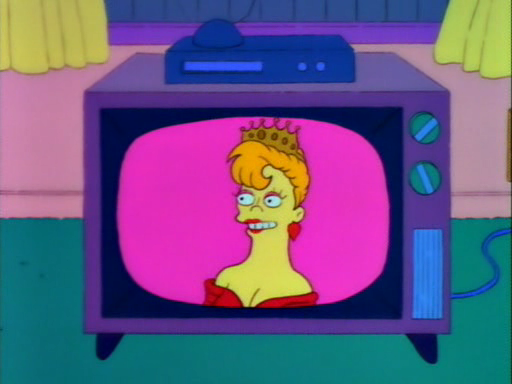 Just Don’t Forget, Citizens of Springfield: You’re Here Forever.